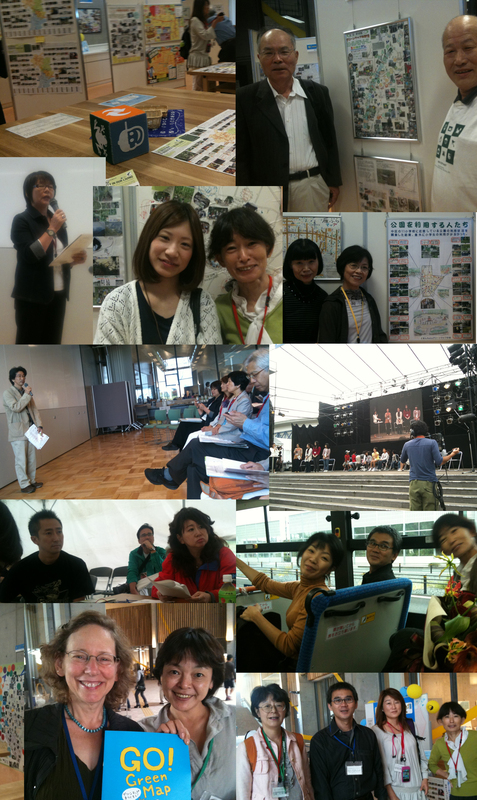 In October 2010, our director, Wendy Brawer, and Jakarta Green Mapmaker, Marco Kusumawijaya of Rujak.org were invited to Japan by Aichi Green Map. Along with Keiko Nakagawa and Hagiwara-san of Chubu Recycle, the NGO that has led the remarkable Aichi effort for 7 years, we took part in forums, exhibits, parties and meetings. Their invitation to Nagoya made it possible for Wendy to take part in events in 4 cities, detailed on this blog post (in our Greenhouse website). Green Mapmakers from Uji, Kyoto, Jakarta, Yohohama, Setagaya and all around the Nagoya area took part - so many new Green Maps were presented that were created by youth, seniors and everyone in between, it was amazing! A new book featuring 40 of these maps was published - download it here (31MB). Wendy says, "I'd like to share one of the great new Green Maps that were produced in support of COP 10, the United Nations conference on Biodiversity. This unique media partnership project began in April 2010, when CBC Radio began collecting suggestions for the Green Map from their audience. A crew would visit the suggested sites, create a 5 minute interview and take photos. The audience learns about the site's attributes in several ways. Every morning around 8AM, a new green site is introduced on CBC's radio show. Each is added to the interactive Green Map, along with the interviews and photos. A printed Green Map was produced for COP 10 too, and since so many countries were taking part, one side is English, and the other Japanese. A PDF (5MB) of each side can be downloaded below. Through this partnership with Aichi Green Map, CBC Radio has showcased over 145 green sites to date! It was exciting to meet the people who make it happen each day - producers, directors, designers, so many talented folks are working together to highlight the region's progress, nature and culture. Taking part onstage with some of the children who contributed, seeing the exhibit's many new maps, hearing the stories - every aspect was delightful! I look forward to hearing what's next from the creative and dedicated people of Aichi!"